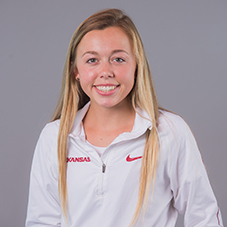 Made her collegiate debut for Arkansas at the Riverside Invitational (Sept. 17) finishing third overall and second for Arkansas in 20:27.39 over the 6K course … in her second collegiate race she placed 15th overall with Arkansas’s ninth-best time at the Chile Pepper Festival (Oct. 1) with a 16:58.40 … At Pre-Nationals (Oct.15) Gray had the third-best time for the Razorbacks at 21:01.40 … In her first SEC Championship (Oct. 28) she ran a time of 20:52.50 which would contribute to Arkansas first place finish … Gray earned her All-Region accolades in the NCAA South Central Region (Nov. 11), running the fifth best time for the Razorbacks and finishing 16th overall, which would help Arkansas to win … To wrap up her first outdoor season with the Razorbacks, she ran a fifth best time for Arkansas in the NCAA Championship (Oct. 19) which was a 21:10.50. 2016 Texas Cross Country State Champion … Four-time Texas Track and Field State Champion in the 1600m and the 3200m … Two-time Foot Locker and Nike Cross Nationals qualifier … Placed ninth at 2016 Brooks Pr invite … 2016 Gatorade Runner of the Year for Texas. Born on May 8, 1998 … Daughter of Bryan and Bonnie Gray … Has one brother; Jacob … Majoring in advertising and journalism.